I decided to take a break and head downtown Toronto and spend an evening and full day at the Luna A suite. 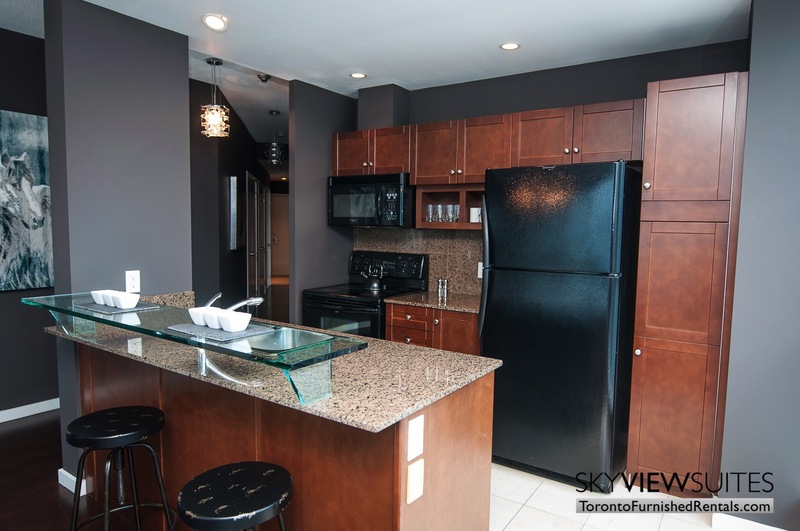 I wanted to get a feel for the neighbourhood and this fabulous Toronto furnished apartment to have a similar experience to what our guests experience during their stay. The suite itself was quiet and isolated from any traffic noise, as it was facing the building’s picturesque courtyard. As a result, I had a very restful sleep. In the morning, I headed down to the large supermarket at the base of the neighbouring building. A 30 second walk opened up a lot of breakfast options for me. I was just going to pick up some coffee, a biscuit and some orange juice, but when I saw that there was a girl behind the counter preparing breakfast food, I decided to have a proper sit down meal. She prepared an omelette for me and added spinach, mushrooms and cheese – making it just right and personalized for me. As I sat down to eat it, with my freshly squeezed orange juice and hot brewed coffee, I was in awe of sitting in a grocery store with a restaurant quality meal in front of me. After breakfast, I walked around the grocery store, seeing what options I had for lunch. There were gourmet sandwiches and soups, freshly prepared salads and plenty of hot food entrees. The grocery store itself was fully stocked and a welcome relief to typical convenience stores that are scattered across downtown Toronto, with very limited options. Belly full and ready for the workday, I ambled back to the building in preparation for some R and R by the rooftop outdoor pool. The pool was great for doing laps and there were plenty of chairs where I could relax and take in the sun. After a restful afternoon, I decided to take a walk to get a better idea of how far everything was from the building. I was able to walk to the CN Tower, Ripley’s Aquarium and Rogers Center in less than 15 minutes. To get to the lake, it only took me 10 minutes. I opted not to bring the car in, so I relied on the Spadina streetcar, which was fast and punctual and got me to China Town and Kensington Market so that I can take some “souvenirs” back home from my visit to the 8 Telegram Mews suite. I also went back to the University of Toronto campus (my old stomping grounds) to visit my old classrooms and favourite studying spots. I was very surprised to see that it only took me 10 minutes to get to the campus by streetcar. All in all, I enjoyed my stay at 8 Telegram Mews. Even though it wasn’t right in the heart of the financial district, it was very conveniently located and had all the amenities I needed for my night downtown.